I read an editorial cartoon a few weeks ago which had a husband and wife sitting on a couch and discussing the evening paper. The husband looks up and says, "Wow. Amazon is going to buy buildings and put books in them for people to buy." With the close of Borders and the potential close of Barnes and Noble, the publishing world continues to flail. E-books outpace hardcovers, self-publishing is no longer anathema, J.K. Rowling just took it all under her own control and cut out the publisher entirely when it comes to her e-books. But what about the bookstore? There is something magical about being in a neighborhood book shop, entering into a welcoming and lovely space and being surrounded by beautiful books. The ability to pick any book up, read through sections of your choosing, browse the older works of a favorite author. The staff of the truly wonderful shops is there to recommend works -- they know the authors, the genres, what is inspirational. It's a place that is tangible and warm and alive. Imagine a world where there were no bookstores. Where everything was ordered online -- or all books became e-books? 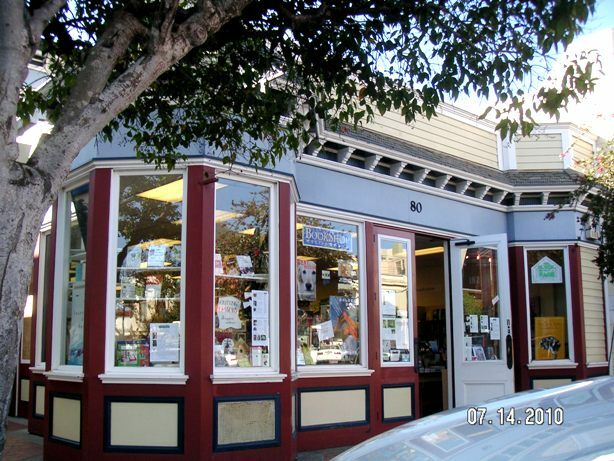 I'm not discounting the benefit of e-books, I'm only saying that a bookstore can be a cherished place of any neighborhood. 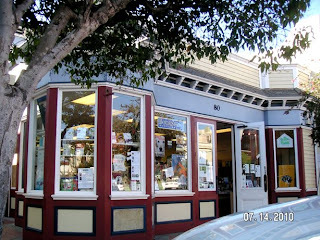 Our neighborhood bookstore is BookShop West Portal. I adore it. I adore the owner and the staff. Stop by on Thursday evening, April 5th at 7pm for a tremendous time. I'll be reading from my novel, Grave Refrain. Come and have a great time -- I'll save a seat for you. You'll be helping a neighborhood treasure. And yes, that is a picture of it. Don't you want to go in? "Ms. Glover’s debut novel is simply riveting. I had my heartstrings pulled and I tended to not want to let go as it spun its magical web around me...you will just have to read this incredibly well written story. It is probably the most captivating list of characters and storyline that I have had the chance to read in a very long time. It is fresh and full of warmth and romance that draws you in with each word, each description and each feeling that tumbles from the pages. As you keep turning the pages you find yourself laughing and crying. You begin to believe once again in the magic of romance with the fumbling ways of beginning love and you begin to remember the way it was when you first fell in love. I cherish this book and look forward to much more to come from Ms. Glover along with the next ghost adventure. You will be spellbound…I am sure of it." My special thanks to Robin the reviewer!!! In the name of improving mother-daughter relations, I find myself sitting across the table from my daughter, our hands covered in a viscous Crisco based icing. It has oozed out of the back of the silver-tipped pipping bags and is making its way down our arms. We have signed up for a cake decorating class, and today we are learning to make shag-muffin flowers. Ours look like some disemboweled fluorescent Muppets. I am intent to have a better relationship with my daughter than my mother had with me. Or I had with my mother. We have thus far navigated the mother daughter relationship somewhat successfully. My daughter, her own force of nature, is a bright and driven, a tomboy who prefers dirt to bathing and obsessively watches the Food Network and Animal Planet. The second child, however, she believes she is second in her parent’s affections and brings this up whenever she wants to steer the familial ship in her direction. This fierceness I recognize from my own mother, and I realize it will serve her well in the world. No one will ever walk over her, pity the fool who does as she once studied Kung Fu. She is the oral historian of the family. She knows every detail of the Venn Diagram of our lives. She mimics me in both deeds and speech. I’m flattered by this and when I watch her sleep my heart yearns for her. I want that happiness and peace for her always. We have adopted the exchange of “I love you,” “I love you more,” which I did with my mother. As the mother, I’m not sure I like this as it dredges up the maternal guilt. Am I not loving her enough? What am I doing wrong? No such guilt seems to leaden her little brow. She is forceful in her declarations. She loves me more because she loves me so much is her explanation. There is no either or. Comparisons between her and her brother can exist, comparisons between mother and son and daughter can exist, but not between her and I. The paradox is strange, and as the teen years loom on the horizon, I’m sure it will become even stranger. Did I want a lover only to receive fighter? Perhaps. But maybe there is a cosmic equilibrium to all of this. We get what we need, not necessarily what we want. Right now, I am content to decorate my cupcake and let her decorate hers. I may tell her to slow down and work on each design, but she will not listen – at least not right away. And congratulations to Victoria for winning an e-book of Grave Refrain!!! Please join me in ushering in my friend, Feather Stone's new blog: http://www.featherstoneauthor.blogspot.com/ Feather is a wonderful writer and her novel, The Guardian's Wildchild is an exciting and entertaining read. A book that will sweep you away. Sarah's Interview at Laura Kaye's! Thank you so much all your support, Laura!! !